Applications are invited from Indian Citizen as defined in articles 5 to 8 of the Constitution of India in the prescribed Standard Form as published in Assam Gazette Part-IX from the intending eligible candidates for filling up of the following vacant Grade-III sanctioned posts under the Directorate of Museums, Assam, Ambari, Guwahati- 781001. Educational Qualification: Bachelors degree from a recognised university or any examination declared equivalent by the Govt. Minimum 6 months Diploma in Computer Application and knowledge of DTP in both English and Assamese. Educational Qualification: HSLC Passed from state/central educational board/ council and 1 year diploma in photography from a recognised institution. Age: Candidates must not be less than 18 years or more than 43 years of age on 1st January, 2017. The upper age limit is relaxable by 5 years in case of SC/ST as per Govt. rule in. Selection Process: The written test will consist of General Knowledge, General English, Mathematics and Assamese for Junior Assistant and General Knowledge, General English, Mathematics for Photographer. No TA/DA will be borne for attending written test/computer test. The successful candidates of written test will be called for Computer proficiency test for the Post of Jr. Asstt. and for the post of Photographer Computer proficiency test (e.g. Photoshop, Graphics & Design) and Photography skill test. Application Fee: All the applicants/candidates have to deposit application fees through Treasury Challan in the Head of Account “0070 Other Administrative Services-60- Other Services- 800- Other Receipts”. and two copies of challan should be enclosed with the application form as follows: General Candidate- Rs. 250.00 and SC/ST/OBC- Rs. 150.00 . Candidates having BPL certificate - Nil The Candidates belonging to BPL category should submit the BPL certificate along with application form. a. Self attested copies of H.S.L.C. Admit card for age proof, educational qualifications, caste certificate and valid employment Registration card and experience if any. b. Self attested two copies of recent passport size photographs. Candidates/applicants must mention the Employment Registration No. along with date in their application in appropriate column. Candidates/applicants will have to mention the name of the post applied for at the top of the sealed envelope carrying the application form. 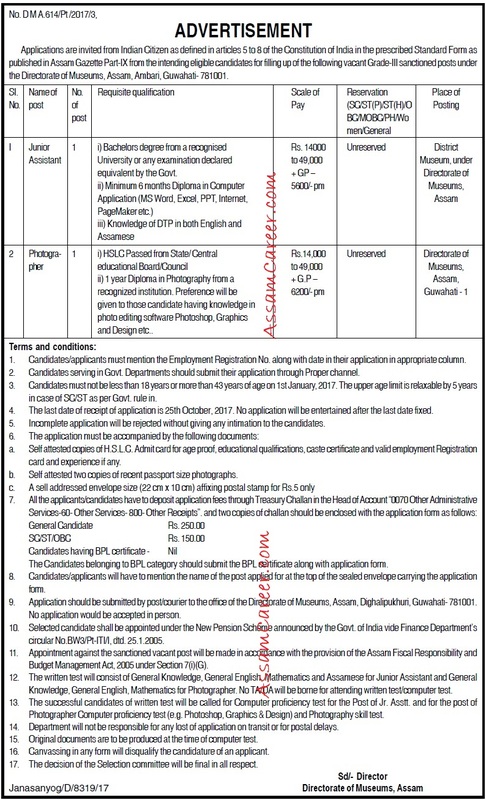 Application should be submitted by post/courier to the office of the Directorate of Museums, Assam, Dighalipukhuri, Guwahati- 781001. No application would be accepted in person. The last date of receipt of application is 25th October, 2017. No application will be entertained after the last date fixed.